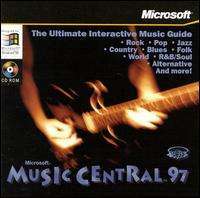 This was a music encyclopedia on CD-ROM produced by Microsoft, similar to their Cinemania product and part of the Microsoft Home range. The software featured a selection of biographical articles from the Guinness Encyclopedia of Popular Music a spin off of the Encyclopedia of Popular Music written by Colin Larkin (writer); along with album reviews from Q Magazine. The software also included still images and full-motion video clips and featured online updates. In-depth information on over 60,000 albums from Muze, Inc.'s definitive discography. More than 30 minutes of rarely seen performance footage, over 50 song clips, and 2,000 photos of well-known musicians and events. Users had the option of taking an informational 'tour' led by the recorded voice of an artist (or an imitation of their voice, in the case of Little Richard) on their own musical genre. This automatically directed the user to particular articles, and played samples of music. Users could also browse by artist, album, and genre, or search for particular keywords. There was also a gallery feature to view portraits, album covers, video clips and song clips.